When you first walk through the front door of Seasons Centre for Grieving Children, you might feel it too… a weight. That’s what first struck me when I started my tour of the home-turned-social service in preparation for news coverage of an upcoming fundraiser. I rang the bell and was immediately greeted by Marcy Baldry, the Centre’s Development Director. She welcomed me into a living room filled with modern and comfortable furniture, along with three of the Centre’s employees; the trio made themselves cozy: two women with a couch each to themselves, while a third sat warmly by a fire, enjoying not just a cup of coffee, but also a well-deserved break. They’ve got a harder job than you know. The room was very bright, warm, even welcoming considering the reasons most pass through it, but the weight present in that room could also be felt in funeral homes. Season Centre does not tip-toe around death. The faces of the deceased grace the upper half of the living room/reception area, including those of Samantha and Jessica Ramey, aged 10 and 12, to whom Seasons Centre for Grieving Children is dedicated. The two sisters were killed in a car crash in 1995; their father would found the Centre in their memory that year. The young girls’ faces, while in pride of place above the fireplace, are among the dozens of photos that line the upper part of the room, giving it the weight one immediately feels here. Get used to it. Marcy took me around, and showed me the few sparse rooms on the ground floor that serve as an administrative area of the charitable organization; a not-for-profit social service doesn’t run by itself after all. 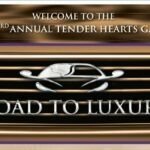 Marcy is one of a handful that keep the lights on around the Centre, through grant-writing and fundraising primarily; not a cent comes from taxpayers, the kids aged 5 – 24 who make use of the Centre, nor their caregivers. That includes my day’s tour guide. his mom introduced him to the place after his dad died of cancer. Wyatt spoke frankly of this during a tour he agreed to give me. 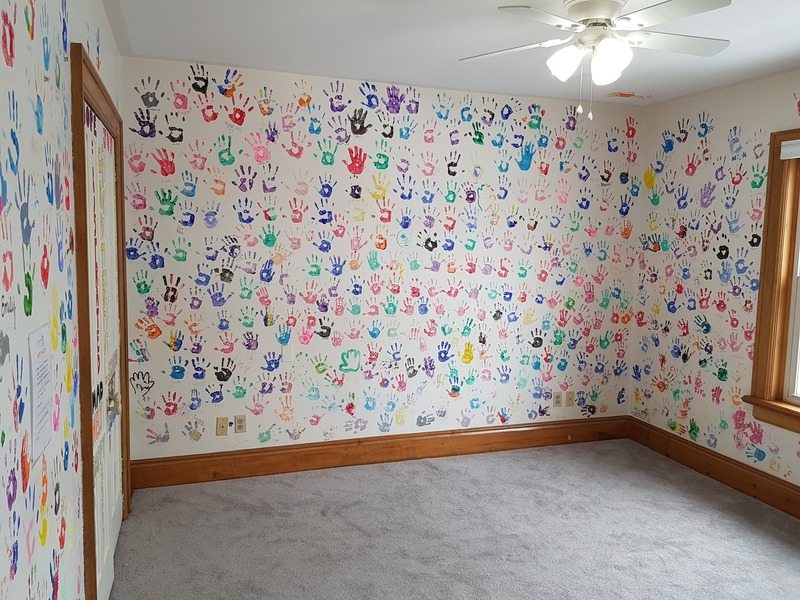 His hand print is one of perhaps hundreds that cover the walls of the first room he brought me to, a rainbow-coloured record of the children that have come through here. Wyatt told me this otherwise empty room is where he and a handful of other kids around his age get together for an hour per visit to talk about their grief. Like I said, they do not tip-toe around death here. In fact, it seems these kids are encouraged to stare it down, a hardship that many seem to accept with a boldness a few of us grown-ups have to admit we lack. I had to wonder how many tears that carpet has absorbed in its time however. 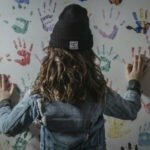 Wyatt outlined a visit to the Centre involves getting together as a group in that room for sixty minutes to use plain, blunt language in discussing the death of their loved one. They don’t call it a loss here, for example, nor have their loved ones “committed” suicide; such language implies the loved one can either be found, or has perpetrated a crime. They have died, whether by nature or by hand. Trained volunteer councillors work to help kids like Wyatt accept this, and as their slogan suggests, find “hope inside the grief”. the next room. Most of them, I’m told, choose to build friendships. Next, Wyatt quickly buzzed right past a small nook filled with toys and a hallway covered with what some might think is graffiti, and took me into a room lined with gym mats, filled with teddy bears, and appropriately called the Volcano Room. It’s a space, Wyatt says, where you can’t get hurt. And this is where he and I sat, cross-legged on a pile of teddy bears, to talk about the Season Centre, death, and grieving. My voice cracked once or twice during the interview, his did not. Admittedly, there was a crack in my voice a few times in my initial walkthrough of the upstairs, kid-portion of the Centre with Marcy just ten minutes prior to Wyatt’s arrival too. I was initially promised a tour from Wyatt, but I think Marcy knew what she was doing when she offered to take me through first; it certainly lessened the impact when Wyatt had his turn. The toy-filled nook Wyatt had buzzed past, for example, left me with a lump in my throat and frankly, a misty eye or two. Marcy tells me the worn model of a house in that nook is used for younger kids to recreate how their household has changed after their loved one has died, allowing kids to remove dolls, beds, and other furniture as needed. Beside that, a child-sized dinner table set much like my own daughter had, that allows children my daughter’s age to practice setting a table with one less plate. 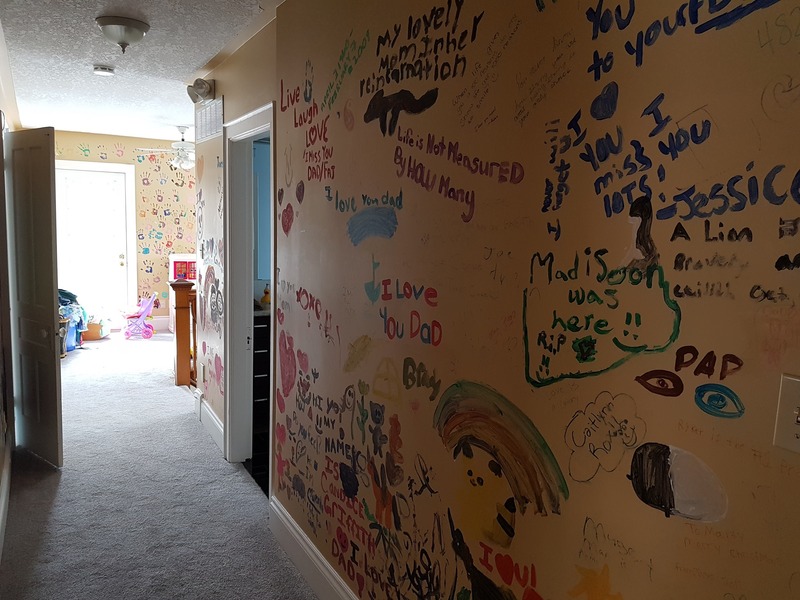 The hallway filled with “graffiti” was actually lined, top to bottom, with messages to the dead from the children they left behind. A multi-coloured “I love you Dad” painted just above waist-height left me needing to call my daughter, just to hear her 4-year-old voice. Wyatt’s message, I later saw, graced a spot near the doorway to the Volcano Room. Marcy already told me the Volcano Room was a place where kids couldn’t get hurt, just like Wyatt later did, but she adds they can’t get hurt while erupting with anger there. 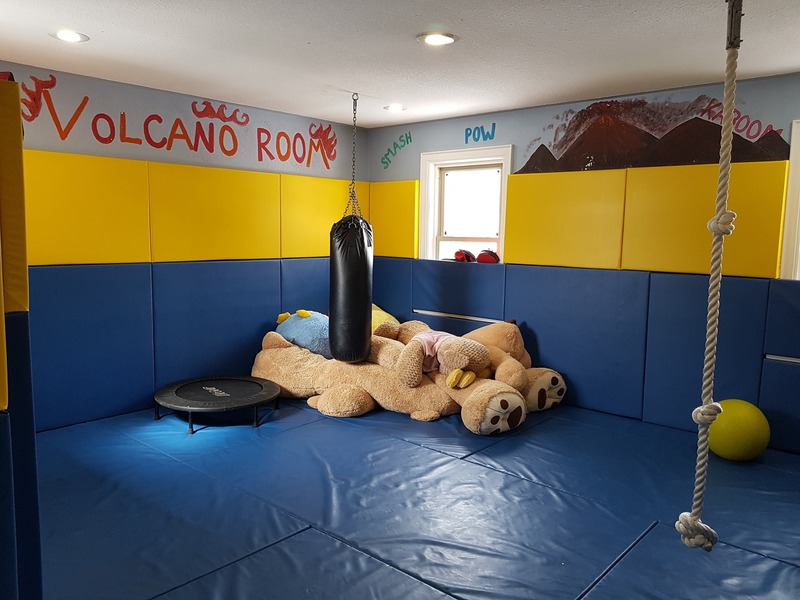 The Volcano Room has a punching bag, the teddy bears as perhaps surrogates, the whole room designed to allow children to thrash around and expel a completely rational rage they likely don’t yet understand, without too many bumps and bruises. A Splatter Room adjacent allows kids to throw paint in frustration instead, perhaps as a more artistic outlet. 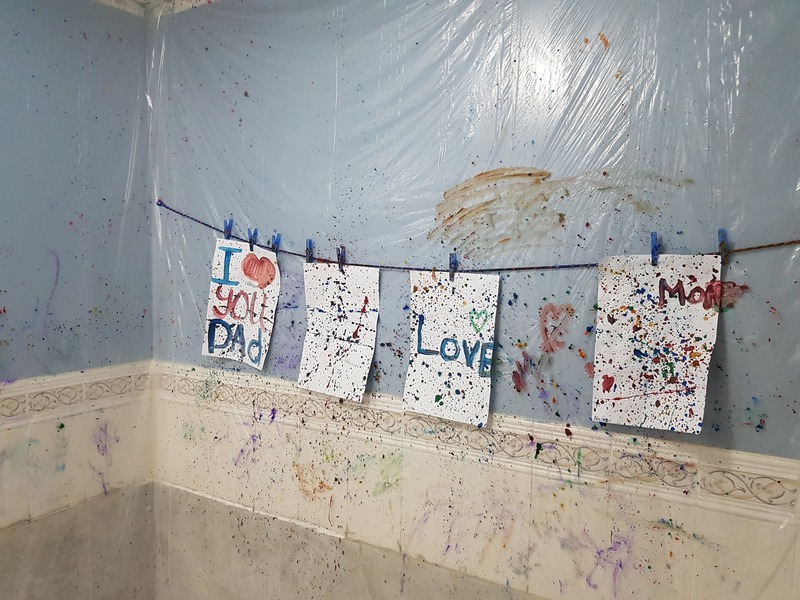 One piece of art was still hanging on the wall by the time I arrived: a simple “I love you Dad” yet again, a recurring theme here, this time splattered with paint and anger. Wyatt didn’t really touch on the purpose of either room, but that is his right; these spaces are about private expression of emotion, I should never have intruded. Our tour complete, our interview concluded, Wyatt showed me back downstairs to where Marcy and his waiting mother were having some coffee. Wyatt and his mom then drove off, bound for their home in Bradford. The pair drives up to Barrie once every two weeks to go to Seasons Centre, but admit it might be more frequent if it weren’t for the half-hour journey. Marcy tells me there is only one other centre to address grieving children in the province, and that is in Oakville. Two. 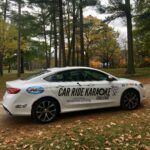 Two such services in the whole of Ontario. While the province does offer some bereavement services, and groups like the Canadian Mental Health Association make available a significant amount of literature on grief, none focus specifically on the pain children go through. Simply put, there is no other place like Seasons Centre for Grieving Children. Without doing the research however, I’d have been able to tell you that anyway, just from my tour with Wyatt alone.